The University of the Cumberlands appears in our ranking of the Top 10 Master’s in Counseling Degrees Online. The University of the Cumberlands offers three programs in the psychology department as well as four counseling programs. At the undergraduate level, students have the option of pursuing a B.A. or B.S. in psychology. The required 17 credit hours that make up the core include introductory classes like Careers in Psychology and History and Systems in Psychology as well as a two-part Research Design and Statistics track, all culminating in the Senior Seminar. Students can choose between a variety of electives for the remaining 21 required hours in the major. The University of the Cumberlands also offers this program entirely online. In this version, students complete 13 required courses which include the above-noted core as well as a survey of the different psychology specialty areas including classes like Social Psychology, Learning and Cognition, and Human Development. Online students must also take 18 hours in one of four special areas of concentration, choosing between the clinical, graduate track, business psychology, and ministries options. The graduate program offered through Cumberlands’ psychology department is the Psy.D. in Clinical Psychology which consists of 103 total credit hours with face-to-face classes scheduled at night or on weekends and 21 hours offered completely online. The program is a combination of theoretical coursework including Personality Theories, Social Bases of Behavior, and Personality Assessment and experiential classes involving practicums in assessment and psychology as well as a doctoral project and clinical internship. Graduates are eligible for a clinical psychology license in the state of Kentucky. The counseling department also offers graduate degrees in the field including two master’s degrees, a Ph.D., and an Ed.D, all of which are offered only in the online format. All students in the counseling master’s programs complete the 48-hour counseling core classes. These include courses like Legal and Ethical Issues in Counseling, Theories in Counseling, and Etiology and Diagnosis of Mental Disorders. All students must complete three practicums totaling 700 hours of work in the field. The final four required courses depend on specialty. For the Master of Arts in Clinical Mental Health Counseling, the track includes Marriage and Family Counseling and Process and Techniques in Counseling, while the addiction counseling specialization features courses like Family Therapy in Addiction Treatment and Spirituality and Values in Counseling. The curricula for both the Ed.D. and Ph.D. in Educational Leadership in Counseling and Education Supervision are almost identical, but the Ph.D. requires six extra credit hours and is for students interested in research and teaching rather than working in the practical/clinical setting. Both programs can be completed in three years, and coursework is divided into three categories, leadership, professional research, and specialty area with the specialization options of assessment, Christian ministries, leadership, and addiction. Students do not have to come to campus for any classes, and many professionals continue to work full-time while working through the program. 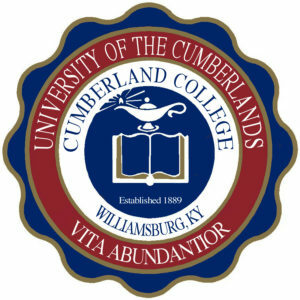 Dating back to 1889, the University of the Cumberlands originally was known as the Williamsburg Institute as it was built in Williamsburg, Kentucky, and the school has had close ties to the Baptist church from its inception. The school enrolls over 11,000 students in its 40 undergraduate majors and 36 graduate degree tracks, and Christian beliefs and teachings are emphasized in all fields of study. Service is a central aspect of their faith, so it is no surprise that Cumberland students completed more than 27,000 hours of community service in 2018. While its values have remained stable, much else has changed on campus since 1889. In 1988, the school offered its first master’s degree and, since then, has built a robust online platform also. The U.S. News and World Report has ranked the online criminal justice program at #8 nationally and the online graduate education programs #115 out of 311 schools. The Southern Association of Colleges and Schools Commission on Colleges (SACSCOC) first accredited the University of the Cumberlands in 1964 and most recently reaffirmed this in 2016. This process ensures that the university measures up to quality standards in all aspects of its operation including the expertise of its faculty, course offerings, financial management, and organizational structure. In addition, the counseling programs at Cumberlands are separately accredited by the Council for Accreditation of Counseling and Related Educational Programs (CACREP) which verifies that the curriculum and training prepare students appropriately for professional life. The undergraduate application for admission to the University of the Cumberlands can be completed online, and freshman applicants must also submit high school transcripts showing a GPA of at least 2.0 as well as ACT scores. Transfer students only need to send college transcripts as long as they have 12 or more transferable credit hours. For admission to the Psy.D. program, prospective students need to complete a graduate application, supplemental questions, and three short personal essays. Additional required materials include official transcripts showing completion of an undergraduate degree with a GPA above 3.0 and 12 or more hours of undergraduate psychology coursework, three recommendations, a resume, and a GRE score higher than 300. All competitive applicants will be invited for an admissions interview. The counseling programs at Cumberlands all require a completed bachelor’s degree with at least a 3.0 GPA. To apply, prospective students must submit official college transcripts, a writing sample, and two letters of recommendation. The counseling doctoral programs require a master’s degree with a GPA of at least 3.5, a GRE score of above 300, and a satisfactory score on the Cumberlands Foundational Skills Test. Complete applications include three recommendation letters, and all qualified applicants have an interview with the program director. Undergraduate tuition for campus-based students is approximately $23,000 per year with the online programs costing $199 per credit hour. For the doctorate in clinical psychology, each credit hour costs $550 with the entire program estimated to cost almost $60,000. Counseling master’s and doctoral programs cost approximately $25,000 total with tuition costing $400 per credit hour. Many graduate students maintain employment and take advantage of related tuition reimbursement or loan forgiveness programs. In addition, University of the Cumberlands does offer scholarships for students including the Presidential, Christian Leadership, and Lewis Appalachian scholarships.